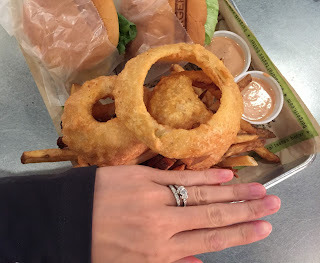 Every since I saw photos of good looking onion rings on Instagram, I was interested in trying BurgerFi, a burger chain. There're some tables outside and tables and counters inside. When we got there after 2 PM on Sunday, the inside was almost full. Their burgers are made with 100% American angus, and the board said, "No hormones, no antibiotics." 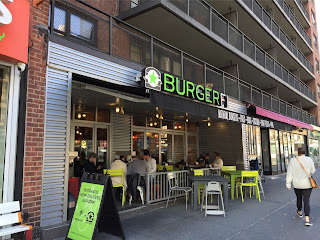 Burgers are from 7 to 11 dollars, and the prices were rather expensive. I got "Conflicted Burger" with sauce on the side because BurgerFi sauce looked like thousand island dressing. 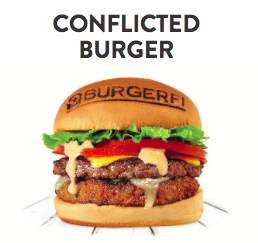 As the name shows, it's a "confused" burger because it comes with a beef patty and a veggie patty, so it's a perfect for me who couldn't decide between 2 very different choices. 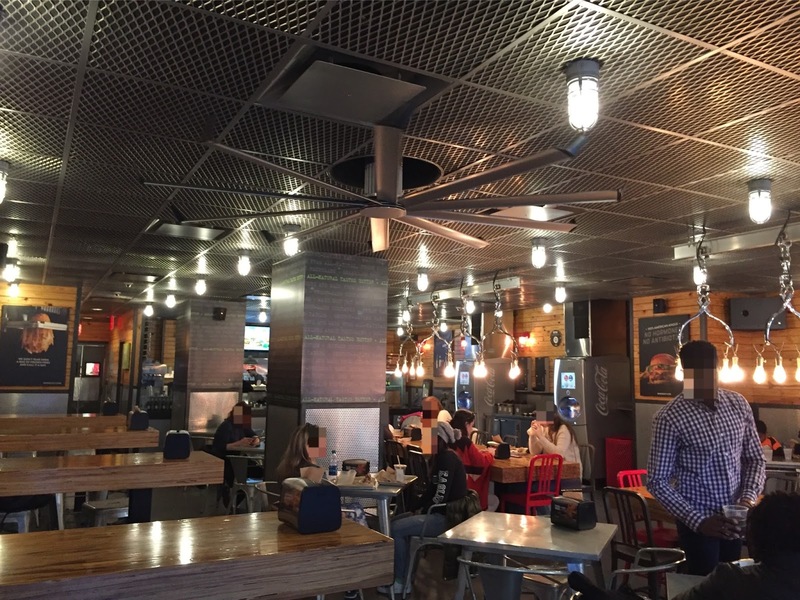 They gave us a buzzer, and we waited, waited and waited for good 20 minutes for burgers and sides. Conflicted Burger, BurferFi Cheeseburger (Single) and Cry + Fry with 2 cups of sauce for the burger. 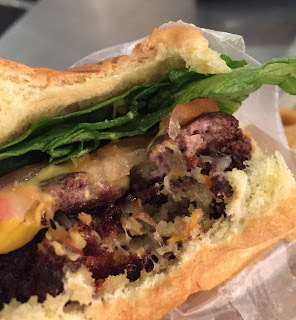 There're a natural angus patty, veggie patty, American and white cheddar cheese, lettuce, tomato minus BurgerFi sauce. A hot ironed logo on the bun. From the top, there're lettuce, tomato, American cheese, angus beef patty, white cheddar cheese and veggie patty. 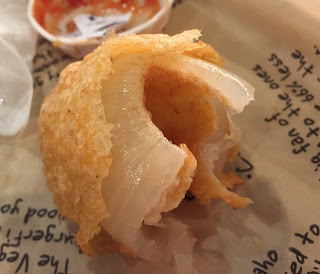 The bun was soft, sweet, and light yellow so that I think it's a potato roll. Lettuce and tomato were fresh, the beef patty was juicy and the veggie patty had crispy surface with moist and smooth filling, and it's similar to a croquette. 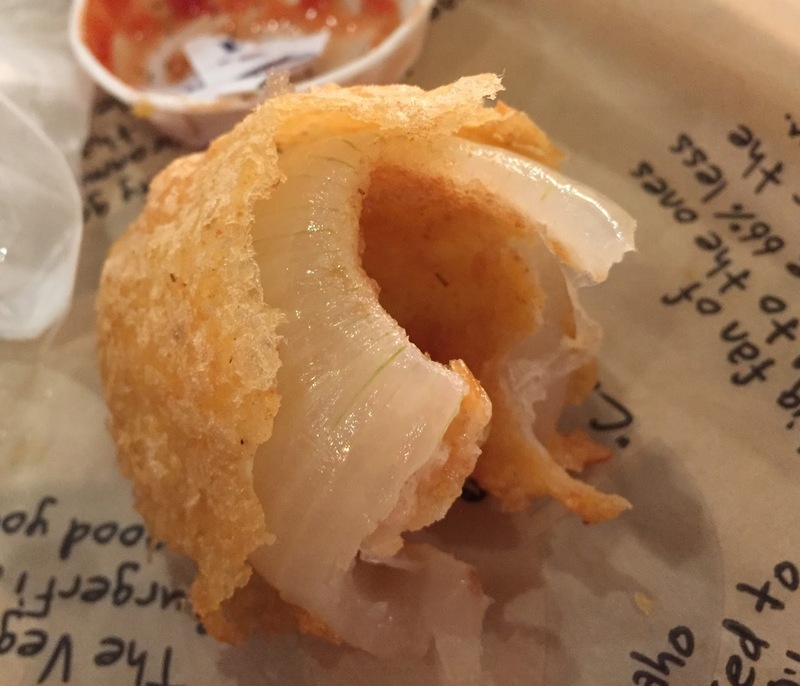 I have no idea exactly what was in the veggie patty, but from the texture and taste, I think it's a mix of potatoes and onions. 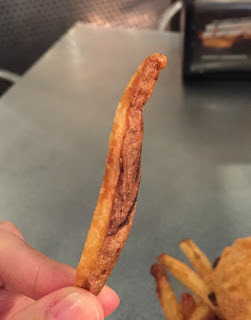 The surface was crunchy like breading, but it could have been just nicely seared. 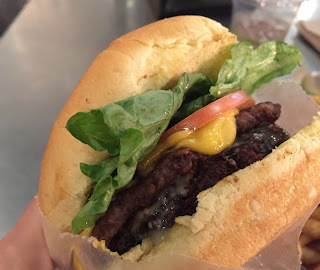 I enjoyed the meaty but also veggie-full burger in one bite with melty cheese. 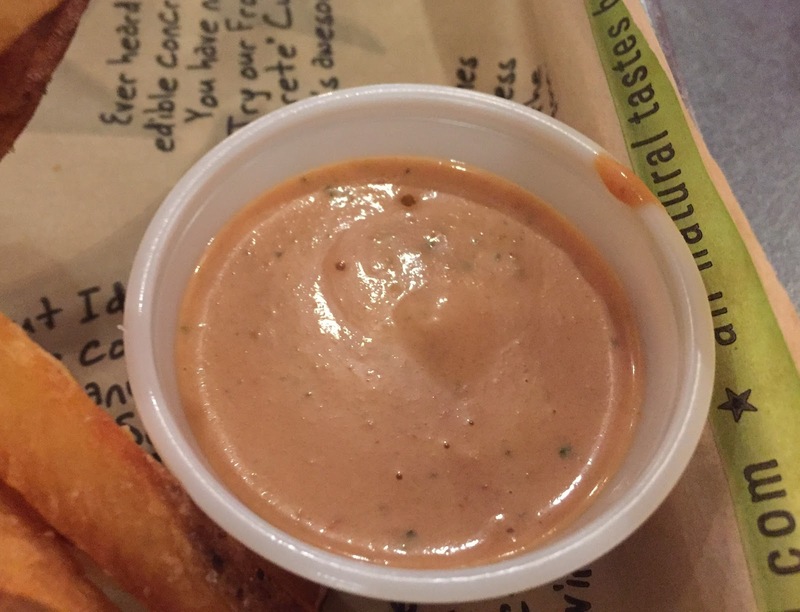 BurgerFi sauce was almost like thousand island dressing but it had intense sour flavor as if they had poured dill pickles juice. In a container, there're 3 humongous onion rings and hand-cut fries. 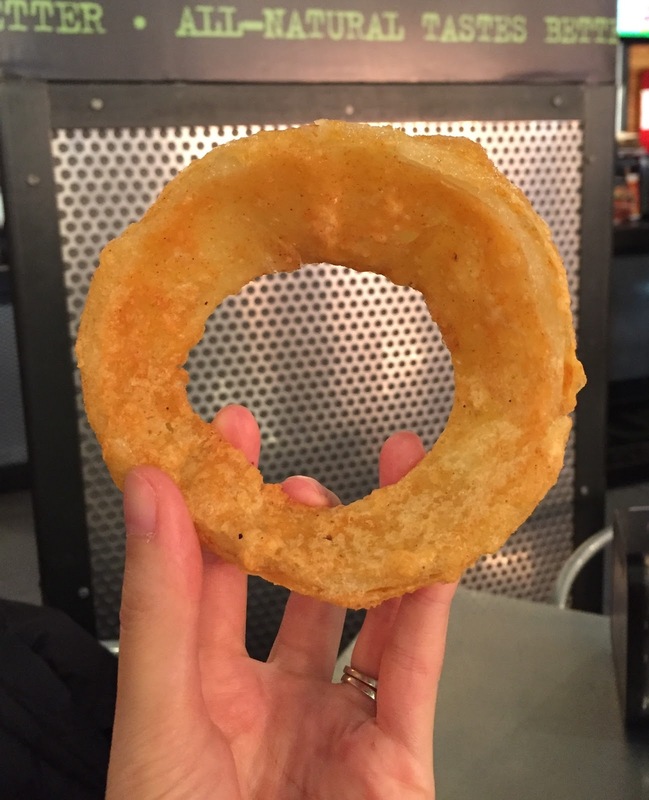 I've never seen any onion rings this size. 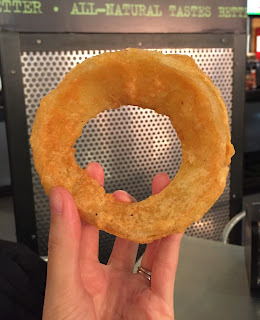 The batter was crispy and the onion inside was moist, and it even had crunchy texture. The batter came off easily and I had to be careful not to let it slip off from my hand. 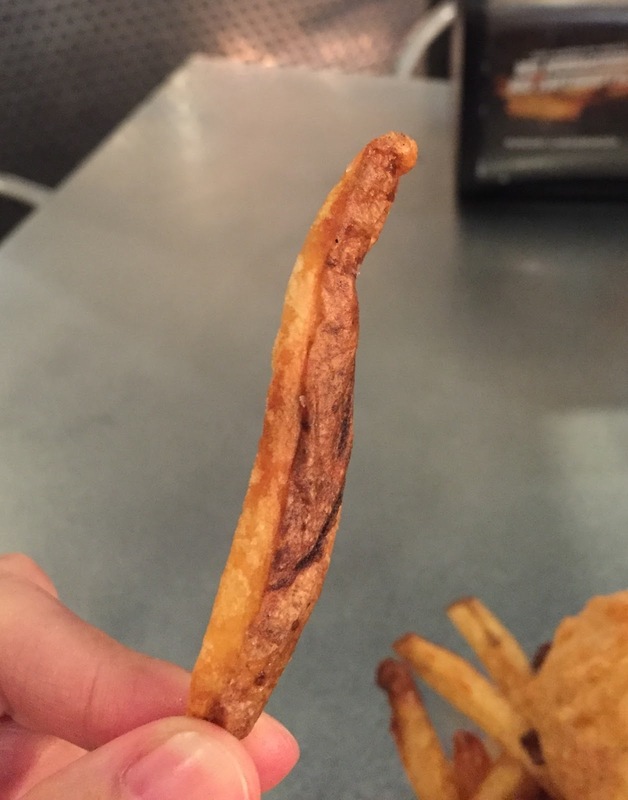 Hand-cut fries were thick cut with skins on. 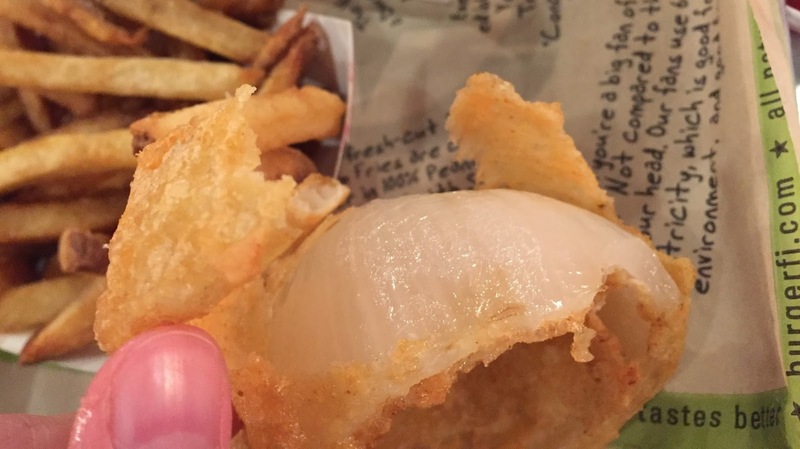 It's lightly salted and tasted the same as what Five Guys serves because BurgerFi uses 100% peanut oil. Coca-Cola Freestyle has only one size of the cup. 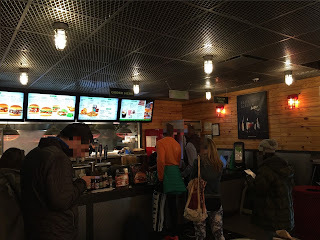 It took them 20 minutes to get the food when we arrived at the restaurant after 2 PM, but around 3 PM, the space was more than half empty and the customers were getting their orders much faster and smoothly, and from that experience, maybe going there after 3 PM makes more sense on weekends. Burgers, onion fries and fries were all good but I didn't want to wait for more than 20 minutes for them.